Abstract We review recent laboratory experiments, field observations and numerical modeling of internal waves produced by tidal motions, with specific focus on the Australian North West Shelf. Distinct regimes are observed depending upon both the characteristics of the ambient density stratification, the topography, and the intensity of the tidal forcing. The character of the near boundary flow in the region where waves are generated is very important in determining the internal wave response. When cyclones are present, the intense mixing over the water column can suppress the formation of tidally generated internal wave motions for many days. Internal waves are ubiquitous in the ocean and can be generated by turbulent stirring (e.g. Munroe and Sutherland 2008) or by mean motion, such as tidal flows over topography (e.g. Baines and Fang 1985). The action of the tide sweeping stratified water over oceanic topography leads to the generation of internal waves of tidal origin (internal tides) which can, in turn, play an important role in deep ocean mixing and large-scale ocean circulation (e.g. Munk and Wunsch 1998; Wunsch and Ferrari 2004) and is the focus of the present paper. of internal waves is thus the topographic steepness parameter y = S/a, where S = hs/ls is the average slope of the topography (hs and ls are characteristic vertical and horizontal lengthscales) and wave slope is defined as a = tan 0. Note that by this definition Y is an overall parameter and the usual definition of a critical point (e.g. Gostiaux and Dauxois 2007; Zhang et al. 2008) is when the local bottom slope matches the wave ray slope. In addition to the forcing frequency <, as the tide is characterized by a tidal velocity U0, other parameters of importance in internal tide generation are (e.g. Garrett and Kunze 2007) the topographic Froude number Fr = U0/Nhs and the tidal excursion parameter U0/rnls. For subcritical topography (y < 1), and in the limits when U0/rnls ^ 1 and hs/H ^ 1, linear internal tides are generated (Balmforth et al. 2002; Bell 1975; Legg and Huijts 2006). As the topography approaches criti-cality (y = 1), the internal tide manifests itself as a beam-like structure, emanating from the critical point on the topography (Gostiaux and Dauxois 2007; Griffiths and Grimshaw 2007), while for U0 /rnls > 1 the response is dominated by higher harmonic frequencies (e.g. Bell 1975). Internal wave motions are commonly observed near continental slopes (Hollo-way et al. 2001; Lien and Gregg 2001), seamounts (Lueck and Mudge 1997; Toole et al. 1997), mid-ocean ridges (Ray and Mitchum 1997) and near continental shelf regions such as the Australian North West Shelf (NWS). The NWS has strong tidal forcing and is home to many vigorous internal wave motions which can play an important role in the energy budget and hence turbulent stirring of the Shelf waters (e.g. Holloway et al. 2001; Van Gastel et al. 2009). The NWS region lies in the parameter space y < 2, U0/rnls ^ 1, and Fr ^ 1. Field measurements are sparse and only provide information at point locations. Therefore it is often difficult to identify the physical generation mechanism of the internal tide and the subsequent internal wave propagation and dissipation in a given region. This paper therefore reviews recent laboratory, field observations and numerical modeling of internal tide generation with specific focus on the NWS. As the NWS is also prone to cyclones during the summer season, we conclude with an examination of cyclone influences on the generation of internal tides. Fig. 9.1 Configuration of laboratory experiments by Lim et al. (2008, 2010). The vertically oscillating plunger at the left end generates an oscillating barotropic flow over the slope/shelf topography at the other end of the tank. Experiments were done with a two-layer density stratification and b continuous density stratification ably larger than previous experimental studies and the experimental configuration is shown in Fig. 9.1, where both idealized two layer and continuously stratified versions of the stratification were used. In the two layer experiments, Lim et al. (2008) documented differing responses delineated by two parameters: a Froude number Fr = U0f^g'hE and the layer depth ratio on the shelf ß = h\/h\ + h2S (see Fig. 9.1). Their classification scheme is shown in Fig. 9.2. If the upper layer depth on the shelf was thin (i.e. ß < 0.5), linear internal waves of depression moved onto the shelf. Only if the lower layer depth on the shelf was thin (i.e. ß > 0.5) were strongly non-linear waves observed with both surges and distinct bores present. In this latter category, the Froude number also became important, and with strong tidal forcing when Fr ^ 1 there was no internal wave response observed at all on the shelf. Fig. 9.2 Two layer regime classification scheme (from Lim et al. 2008). The Froude number Fr = U0/^/g'hE where the equivalent depth hE = h1h2s/(h1 + h2s), ft = h1/h1 + h2s and the depth scales are defined in Fig. 9.1a of the wave characteristic slope (see Eq. (9.1)) tangent to the local bottom slope. If there was no critical slope present in the domain, then there was no internal beam generation. The region of beam generation was shown to occur within a finite length of the slope (0.75 <s/scrit < 1.3), and this length was approximately twice the local near-bottom fluid excursion. The velocities along the wave characteristic was shown to be elevated, consistent with previous field studies (e.g. Holloway et al. 2001; Lien and Gregg 2001) and laboratory (e.g. Peacock et al. 2008; Zhang et al. 2008) observations. Increasingly energetic conditions led to the generation of a bolus (e.g. Venayagamoorthy and Fringer 2007) causing much over-turning and stirring as it propagated upslope and dissipated. where the simplification is valid since a? ^ N2 in the laboratory. The general trend is that as the forcing increases the response changes from linear beams to nonlinear bolus features and finally to no waves at all. A summary of the observed behaviour is shown in Fig. 9.3. Beams required a critical slope to be present and were observed in the regime G < 80. The absence of beams beyond this range was due to the disruption of the flow field caused by the appearance of an upslope-propagating bolus, even though a local critical point was present. There is some overlap in regimes, but the bolus feature was formed over a wider range of forcing (5 < G < 600). Finally, for large forcing frequencies and amplitudes, no waves were formed as the rapidly oscillating barotropic forcing completely dominates the flow. So in summary, distinct regimes are observed in both the two layer and continuous stratification cases, and the character of the near boundary flow at generation region is important in determining the baroclinic response. In recent years there has been much focus on the process of internal wave generation and propagation on the NWS from both an observational (e.g. Van Gastel et al. 2009) as well as a numerical modelling perspective (e.g. Meuleners et al. 2011). 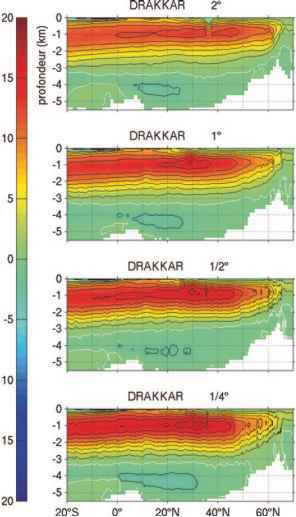 The actual density stratification on the NWS is a combination of the two idealised limits considered in the laboratory experiments above, and thus the observed response a combination of both direct generation of large scale internal waves in the thermo-cline offshore of the shelf break and beam-like internal waves propagating upwards from critical points on the slope, at typically 500 m depth scale, and being trapped in the ever-shallowing shelf waters. This is most clearly seen in the numerical experiments using ROMS described by Meuleners et al. (2011). ROMS was run in a domain of 800 km by 500 km along the coast with a nominal 2.2 km grid resolution. Model minimum depth was set to 20 m and there were 70 sigma layers in the vertical staggered to increase resolution near the bottom. The domain consisted of three open boundaries on the northern, southern and western extents, and at these boundaries tidal forcing was applied using the TPXO.7.1 tide model, and daily averaged wind and heat fluxes applied at the surface from NCDC and NECEP/NCAR reanalysis data sets, respectively. Initial density fields and boundary conditions were supplied from the BRAN version 2.1 (Oke et al. 2008). Runs were made in conditions representative of summer 2004 in order to compare with a field experiments conducted at the time (Van Gastel et al. 2009). 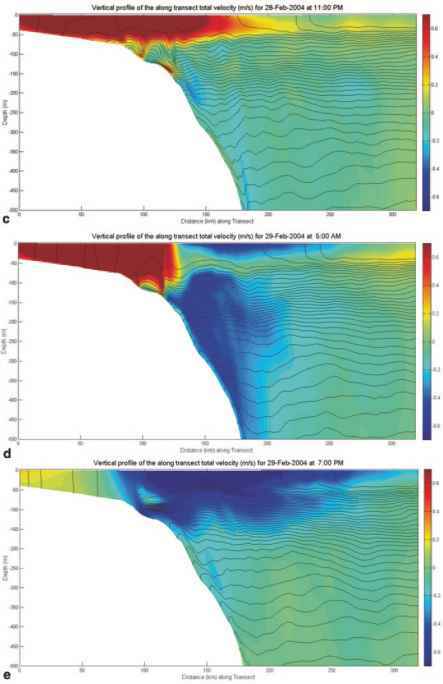 Figure 9.4 shows a typical snapshot from the simulations along a transect extending offshore through the North Rankin A oil and gas platform—site of the field experiments in 124 m of water. The transect shows internal wave generation occurring near critical points near depths of 400-600 m and approximately 70 km seaward of NRA. Internal wave beams originating from this slope then forward reflect, although note the actual aspect ratio of the beam has vertical to horizontal scale ratios of approximately 1:50. Additionally, small amplitude but large horizontal wavelength depressions of the thermocline occurs offshore of the shelf break during ebb tide. This depression then self-steepens as the wave moves on shore. 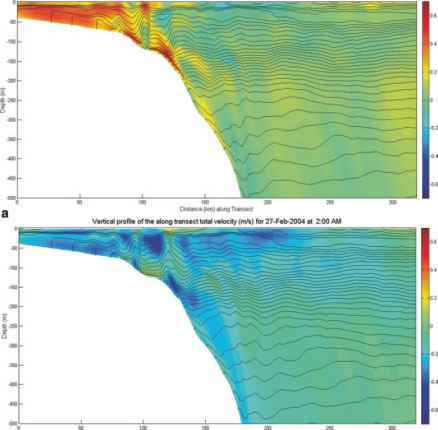 Model simulations over many tidal cycles shows it takes approximately 36 h (three tidal cycles) for an internal wave to travel from the offshore generation region to NRA, which is consistent with the steepening timescale estimate of Horn et al. (2001). The two forms of internal wave eventually form the highly non-linear large amplitude internal waves in the thermocline in shallow inshore waters seen at NRA, for example (Fig. 9.5). These waves of the type shown in Fig. 9.5 are significantly non-hydrostatic, and cannot be described by hydrostatic codes like ROMS. Van Gastel et al. 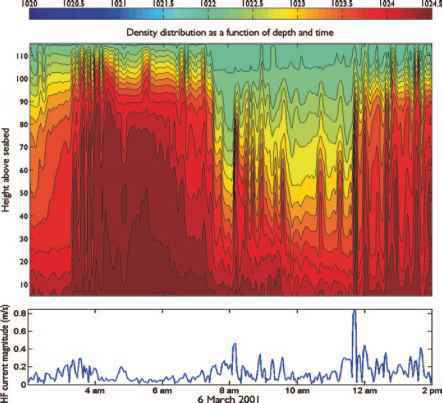 (2009) describes local measurements in the 124 m water depth at NRA, and found peak wave amplitudes were as large as 80 m and associated phase speeds of packets up to 1 m/s. These waves are stronger in summer than winter and as the modelling showed, due to the curved nature of the offshore bathymetry, the process of wave generation by the tide is three dimensional along an arc of approximately 120 km in length with a focussing of wave energy towards NRA. In addition to tides, the NWS is also forced by cyclones during the summer season. Davidson and Holloway (2003) were the first to study the influence of TCs on internal tide generation on the NWS. The model studies of Cyclone Bobby by Condie et al. (2009) examined the biological productivity and found the phytoplankton response is limited by cyclone-induced sediment resuspension and hence nutrient input to the water column. Recently, Zed (2007) used the Regional Ocean Modelling System (ROMS) to investigate the induced currents and the vertical mixing under the influence of TC Monty in 2004. Wind and pressure forcing for Monty was supplied with high spatial and temporal resolution data from the double vortex model CycWind (McConochie et al. 2004), with the wind stress on the water surface estimated using the wind speed dependent surface drag coefficient formulation used by Davidson and Holloway (2003). Simulations were conducted for 2 weeks (the period of the cyclone). Results (Fig. 9.6) showed that wind forcing was so strong that large portions of the NWS were well mixed, essentially up to 150 m water depth and up to 150 km offshore (Fig. 9.6d). These conditions can persist, along with strong residual currents, for timescales up to 10 days after the cyclone has crossed onto the coast and no longer is providing direct wind forcing. Thus for these timescales of order 10 days, while near-inertial internal waves are directly excited by the wind, the absence of density stratification in shallow shelf waters completely suppressed the normally dominant tidally-generated internal waves from forming. Indeed until the stratification is able to reform, the tides are only able to induce a barotropic oscillation and no significant internal waves of tidal origin are seen over a large domain. Australian North West Shelf. J Cont Shelf Res (submitted) Munk W, Wunsch C (1998) Abyssal recipes II: energetics of tidal and wind mixing. Deep Sea Res. Venayagamoorthy SK, Fringer OB (2007) On the formation and propagation of nonlinear internal boluses across a shelf break. J Fluid Mech 577:137-159 Wunsch C, Ferrari R (2004) Vertical mixing, energy, and the general circulation of the oceans.